It was three o'clock Saturday afternoon and I was standing near the main entrance of the Staples Center with a couple of friends, Jhun Parungao of Woodland Hills, and his visiting friend from Manila, Dr. Armyl Banez. We were waiting for the doors to open to see the fight card for the day featuring among others, Boom Boom Bautista versus Chucky Bonilla. I was at that location because it was near the area where "Press Credentials" were issued. The Staff from Golden Boy Promotions were not there yet to issue the credentials to the press people, so we were all congregating at the area. All of a sudden, I saw the master himself, Freddie Roach standing in the same area seemingly waiting for somebody important. It was odd to see a man of his stature stand among the fight crowd that way. He normally would be with his team in those few hours leading to the fight. Having known him for a while as I made mouth guards not only for the Filipino fighters he trained but also a handful of his own fighters, I did not hesitate to approach him to strike up a conversation and introduced my friends. After the mandatory handshakes and the usual "Hello, how are you", and a very brief photo session, I started an "informal interview", much in the same way it is done in the Philippines. I started the informal interview by asking him why was he hanging around in the area. He told me he was waiting for the ALA Team who earlier in the day picked up the team credentials, including his. He was supposed to meet them there so they can give him his credentials. My next question centered around Boom Boom and his chances in winning his fight. "Boom Boom is ready as can be and I will be surprised if the fight went the distance," Freddie told us. With that I asked him if it was then safe to put my money on Boom Boom. His answer was a resounding "Yes, it is very safe." At that point, I thought I saw my friend who was listening to the conversation, pull out his phone and made a call to his bookie. 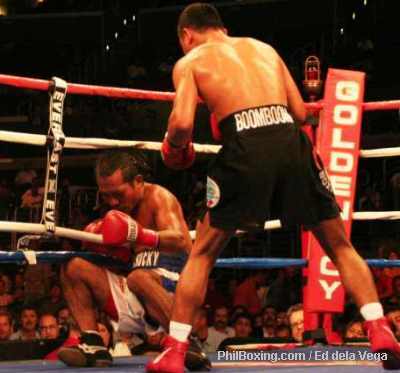 Rey "Boom Boom" Bautista sent "El Chucky" Bonilla of Nicaragua to the canvas in the dying moments of the 3rd round of their 10-round scheduled fight. Bonilla stood up at the count of nine but the referre, seeing Bonilla still dazed, stopped the contest for a TKO victory for Bautista. Asked to elaborate, Freddie mentioned that the training regimen followed by Boom Boom almost to the letter, and the discipline inherent to the kid, plus his ability to absorb and implement instructions are big factors in his present situation. Of course, it does not hurt that he has Ala Villamor keeping up with him and the full support of the Sam Gello-ani and the ALA Gym people. Now, with the Golden Boy Promotions behind him, things can only get better. "The game plan is set and we are ready to go", he said. "How about Z Gorres"?, I asked. Gorres, according to Roach is also on track with his training. Although he expects a harder fight for him against a wily fighter named Jose Laureano, on May 27th at the Home Depot Center, Roach expects Gorres to do very well. "Don't miss the fight, or you will be missing a good one", Roach told us. Then I shifted the questions to everybody's favorite fighter these days, Manny Pacquiao. Roach intimated that Pacquiao may seem a little behind in schedule but now that he is here, he works his tail off. "In the mornings he runs around Park La Brea and at UCLA when we need him to run on flat surfaces and he runs up the Griffith Observatory area when we need him to go uphill"
Pacquiao does his gym training in the afternoons. When he does, Wildcard Gym is closed to the public except for the staff and a very limited number of people. 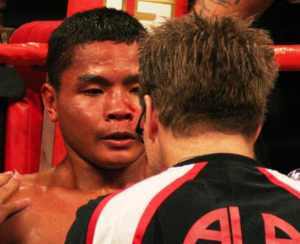 "We are doing the same thing we did on the second Morales fight". "We wanted privacy so we can all concentrate and pay attention to the task on hand" he said. All of a sudden his phone rang. The ALA people on a white Chevy Suburban just drove past on the way to the underground parking of the Staples Center. They wanted Roach to walk over there so he can pick up his credentials from them. With that, Roach bade us goodbye, gave the customary warm handshake, and disappeared amongst the multitude of predominantly Latino crowd who came to see two gladiators in Barrera and Juarez.